More than one in five working American adults, or 21 percent, don't set aside any of their annual income for short-term or long-term goals. That's according to a new survey from Bankrate.com, which asked 1,000 of them how much of their annual income they save for retirement, emergencies and other financial goals. And those who do save, Bankrate finds, aren't putting away a lot: Another 20 percent save only 5 percent or less of what they make, while 28 percent save 6 to 10 percent. Just 16 percent are saving more than 15 percent of their income — and even that, experts say, probably isn't enough to make sure you have both an emergency fund and enough money socked away to retire by 65. What's keeping Americans from saving? When Bankrate asked survey participants, the No. 1 response was "expenses." That makes sense, given that day-to-day costs continue to soar. Middle class life is now 30 percent more expensive than it was 20 years ago. The cost of big-ticket items like college, housing and child care has risen precipitously: The cost of public universities doubled between 1996 and 2016 and housing prices in popular cities have quadrupled, Alissa Quart, author and executive director of the Economic Hardship Reporting Project, tells CNBC Make It. Meanwhile, salaries have largely stagnated, so they don't go as far as they once did to cover the necessities, Quart points out. 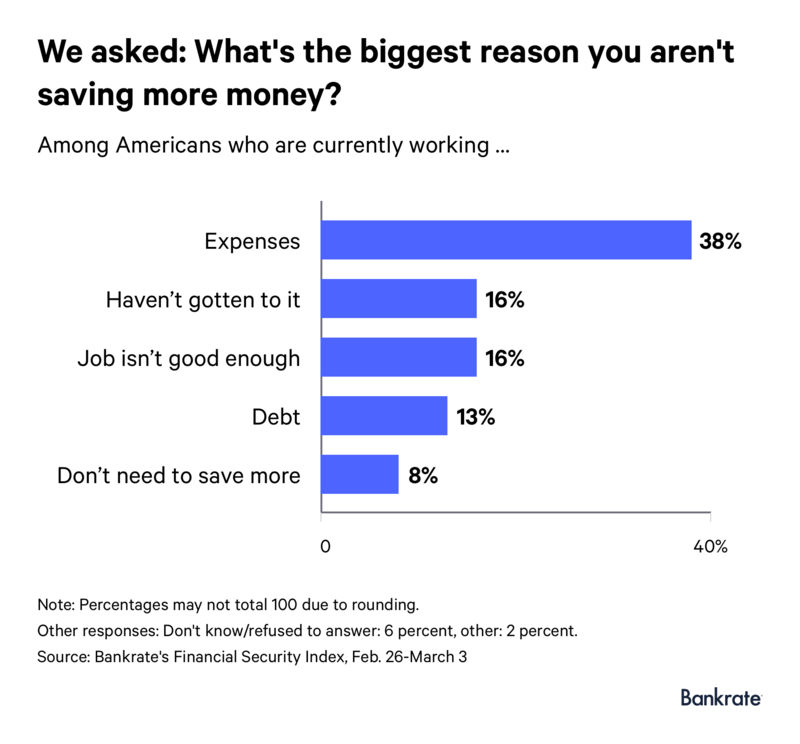 Besides expenses, 16 percent of working adults say they don't have a "good enough job" to be able to save, which presumably means they aren't earning enough. Another 16 percent say they "haven't gotten to it." This is a more common answer among younger people, Bankrate notes: "Twenty-two percent of millennials (ages 23-38) feel this way." While retirement may feel too far off to start saving for when you're young, the longer you put off planning for your golden years, the further behind you'll fall. 1. Start ASAP. The sooner you begin saving and investing your money, the less you'll have to put away each month to reach your goals, thanks to the power of compound interest. If you start at age 23, for instance, you only have to save about $14 a day to be a millionaire by age 67. That's assuming a 6 percent average annual investment return. If you start at age 35, on the other hand, you'd have to set aside $30 a day to reach seven figures by age 67. 2. Automate. Automating your savings — meaning that you have a portion of your paycheck sent directly to a retirement account, such as a 401(k), Roth IRA or traditional IRA, or any other savings vehicle — makes things easy. You'll never even see the money you're setting aside and can learn to live without it. 3. Bank any surplus money. Whenever you come across any extra cash — a bonus, birthday check or small windfall — get into the habit of putting at least a chunk of it straight to savings before you do any splurging or celebrating. To resist the temptation to spend, deposit it right away so you never even see it.